Lis and Nathaniel talk about the lawyer who can save the world or just the poor fellow who got superpowers he didn’t want. The PUNCH LIKE A GIRL Podcast is a Council of Geeks Production! Ryan Daly helps his boy, Rhys, celebrate Women’s History Month by reading up on DC’s mightiest (or so) super heroines as described in The Big Book of Girl Power. Will it get awkward when Ryan tries to explain why he hates the only black character in the book? Tune in to find out! Leave a comment or send an email to: RDalyPodcast@gmail.com. It’s coming! 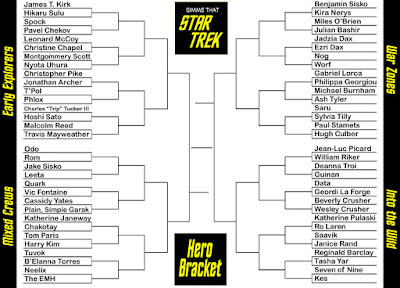 May’s episode of Gimme That Star Trek will pit 64 Trek heroes from across all series in a bracket fight decided by five panelists. And YOU can win Fire and Water merch if you guess the most slots correctly! Here are the opening match-ups. Grab a copy of this sheet, fill it out until it names a winner and send it to Siskoid before April 30th to enter. One point per slot correctly entered. Ties broken by coin flip/dice throw. Identity of panelists secret until transmission. Their criteria (historical importance, look, personality, originality, personal preference, etc.) entirely their own. 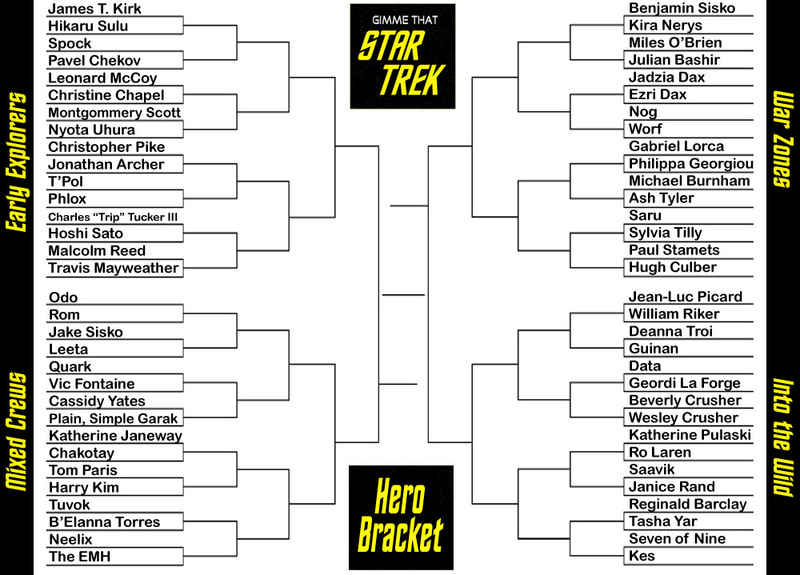 Winner announced in Subspace Transmissions in May’s episode. Film & Water #135 - Will The Real Martian Please Stand Up? Episode 135: WILL THE REAL MARTIAN PLEASE STAND UP? Host of THE THING MINUTE podcast, Harper W. Harris, stops by to discuss not a movie, but a classic episode of THE TWILIGHT ZONE: Will The Real Martian Please Stand Up?, starring Jack Elam and John Hoyt. Original air date: May 26, 1961! It’s a patented FW Team-Up between Canada’s Siskoid and the United Kingdom’s Martin Gray! 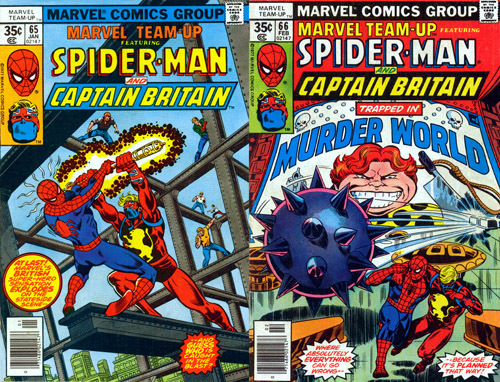 Together they tackle Marvel Team-Up #65 and 66 by Chris Claremont and John Byrne, the North American introduction of Captain Britain! It’s a story with a strong legacy and the heroes of two shores. Truly, it was a classic in the making! Listen to the Team-Up below, or subscribe to FW Team-Up on iTunes! Here are the relevant images from this episode of FW Team-Up! In minutes 121:00 – 125:00, Superman deals with multiple disasters, and Jimmy Olsen gets in trouble at a dam. Special guest: Bob Fisher! The Irredeemable Shag welcomes professional comic book, television, and movie writer Joe Casey (Adventures of Superman, Uncanny X-Men, Cable, Wildcats, GI Joe, Gødland, Officer Downe, and one of the creators of the animated series Ben 10) to discuss Justice League International #17 (Sept 1988)! Captain Atom arrives in Bialya to rescue the team, while in space Big Barda, Martian Manhunter, Rocket Red and G’Nort come closer to finding Mister Miracle as they chase Manga Khan! 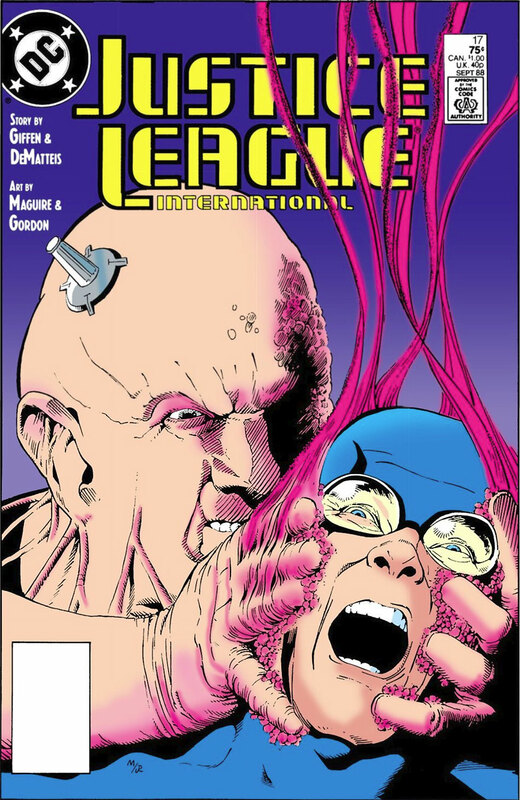 Plus Joe and Shag cover what was on the shelves that same month, recap and discuss the JLI issue, and tackle YOUR listener feedback! 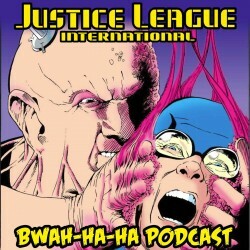 Images for JLI PODCAST Episode #17! Click each image to enlarge! Leave your comments over on the podcast post by clicking here! Ryan Daly attempts to school Rhys in the mystic arts with a primer on the Sorcerer Supreme: A Little Golden Book: Marvel’s Doctor Strange. What magical incantations will Rhys spout out when he sees Shuma-Gorath and Dread Dormammu? Let’s find out!